Daniel Coyle and Simba de la Roque. Photos © Sportfot. 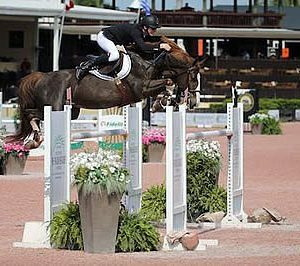 Wellington, FL – April 2, 2017 – The Hollow Creek Farm Under 25 Grand Prix Series hosted its $50,000 final event at the 2017 Winter Equestrian Festival (WEF) circuit on Sunday, April 2, with a win for Ireland’s Daniel Coyle and Simba de la Roque. With consistent results in classes throughout the 2017 circuit riding Diamonte Darco, Lucas Porter (USA) was the winner of the Hollow Creek Farm Under 25 Grand Prix Series overall. Coyle also went on to take top honors aboard Dillinger in the afternoon’s $50,000 Suncast® 1.50m National Grand Prix. Olaf Petersen, Jr. (GER) set the final track for the Under 25 Grand Prix Series Final, featuring the top 22 competitors from the series overall, and eight clear rounds to jump-off for the final prize. Coyle and Ariel and Susan Grange’s Simba de la Roque cleared the short course in 39.94 seconds for the win. Great Britain’s Jessica Mendoza and Horst van de Mispelaere finished second in 41.19 seconds. Shawn Casady (USA) and Abigail Wexner’s Vanilla placed third in 43.71 seconds. Ailish Cunniffe (USA) also cleared the jump-off track in 44.66 seconds to finish fourth riding Whipstick Farm’s Casper. The final double clear round belonged to Wilton Porter (USA) in 44.71 seconds, guiding Sleepy P Ranch’s Delinquent JX to fifth place. Simba de la Roque was one of many new horses that Coyle got the ride on for Ariel and Susan Grange at the start of the WEF season. He has used the Under 25 Series to gain valuable experience and get to know the 11-year-old Selle Francais gelding (Kannan x Allegreto) better. In addition to his win on Sunday, Coyle was presented with the Hermès Talented Young Rider Award for the 2017 WEF circuit. The award is given to the top young rider between the ages of 16-25 who receives the most points in FEI competition during the circuit. Mendoza (20) was also riding a new mount this winter in her ten-year-old Belgian Warmblood gelding Horst van de Mispelaere (Wandor van de Mispelaere x Polydor). Competing at the Winter Equestrian Festival for the first time, Mendoza had great experiences with all of her horses, from the Under 25 Series up to the grand prix level. Casady (22), who works for John and Beezie Madden, got the ride on Abigail Wexner’s Vanilla this year for the Under 25 Series and had solid results with the experienced mare throughout the circuit. 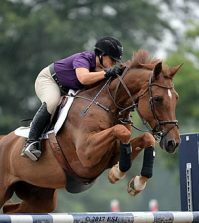 “I started riding her at the beginning of circuit, and our relationship has developed through these classes,” Casady said of the 15-year-old Danish Warmblood mare (Nabab de Reve x Clinton). For his success throughout the circuit and an overall win in the series, Lucas Porter jumped Diamonte Darco, Sleepy P Ranch LLC’s 12-year-old Great Britain Sport Horse mare (by Unbelievable Darco). As the overall Series winner, Porter (19) will be invited to compete in the CSI2* division of the Chantilly Horse Show, a Global Champions Tour event, from July 13-16, 2017, in France. In addition to his entry, Porter will also receive two tickets to the Chantilly VIP lounge and transportation for one horse generously provided by The Dutta Corp. in association with Guido Klatte. “I definitely achieved my goal, and it feels great,” Porter stated. “Coming back from Europe last November, I really pointed Diamonte Darco at the Under 25 Series this WEF. The past few years, I have been fourth or sixth in the overall. It has been really one of my goals since I started the series to win the overall, so I am very happy to do it this year. 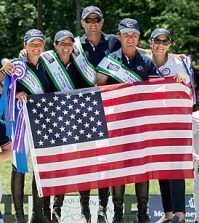 Porter thanked Hollow Creek Farm for sponsoring the series and putting up the impressive increase in prize money for the FEI sanctioning this year. In its seventh season, the 2017 Under 25 Grand Prix Series, presented by The Dutta Corp. in association with Guido Klatte, expanded to ten events offering a total of $215,000 in prize money. 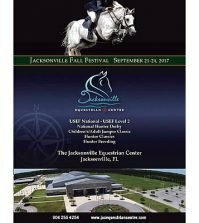 New for 2017, all classes were sanctioned as CSI-U25 events by the International Equestrian Federation (FEI), with the exception of the Team event, and were held under FEI rules. Following his win in the Under 25 Grand Prix, Coyle went on to his second win of the day in the $50,000 Suncast® 1.50m National Grand Prix. Thirty-six entries jumped the final class of the circuit, with five clear rounds to jump-off. Coyle and Ariel and Susan Grange’s Dillinger were the fastest double clear in 39.89 seconds. Jessica Mendoza (GBR) finished second to Coyle again, this time in 41.86 seconds riding Milena Pappas’s Constance. Liubov Kochetova (RUS) and Urus 2 placed third in 43.87 seconds. Dillinger is another of the many talented mounts that Coyle took over riding for Susan and Ariel Grange this winter. The rider explained that it has taken him some time to gel with the ten-year-old Belgian Warmblood gelding (Contender x Capitol I), but he is thrilled with how they ended the circuit. “Dillinger has been a hard one to figure out. He is probably the hardest one of them all,” Coyle admitted. “He has loads of scope and he tries to be very careful; his mind just sometimes gets in the way. Taking on so many new horses was a big challenge for Coyle this winter, but he took his time to get to know each horse and figure out what they need. “The start of the circuit was brilliant with Cita,” Coyle recapped. “Then she started to go up and down a little bit, and we changed tactics for her. Then I changed everything with all of the horses. I tried to start from scratch basically and work with them the best that I could. That is where Sue and Ariel are incredible. They really let me take my time. Also competing in the International Arena on Sunday, Claudia Villamil and Quite Close VD Smis won the $10,000 SJHOF High Junior Jumper Classic, presented by Sleepy P Ranch. Following his unprecedented success this circuit, Chile’s Samuel Parot was presented the Harrison Cup Perpetual Trophy as the horse owner whose horses won the most jumping money in all of the open jumper classes held at the Winter Equestrian Festival. Kelley Farmer of Keswick, VA and Kodachrome, owned by Nina Koloseike Moore, topped the $50,000 USHJA International Hunter Derby on the grass derby field to conclude the final week of WEF. Kodachrome won the class last year with Russell Frey, who Moore had purchased the nine-year-old gelding Warmblood gelding for and worked with Farmer up until he passed away in May of 2016. The class was held over two days with 41 competitors tackling the first round course. The top 25 horse and rider combinations returned on Sunday for a handy round designed by Ken Krome that consisted of ten jumps with four high options and a trot fence. The combinations were scored by two panels of judges: panel one consisted of James Clapperton and Rob Bielefeld, while panel two was made up of Ken Krome and Danny Robertshaw. During both rounds, riders could jump the high option of several fences in order to receive bonus points, and during the second round, riders received a handy bonus from the judges. Entering the second round, Farmer and Kodachrome were sitting in fourth place with a score of 179.25, but their handy round score of 199.5 brought their total score up to 378.75 to take the win. 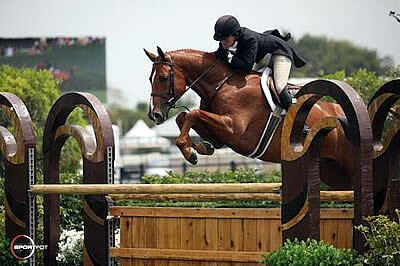 Peter Wylde of Lake Worth, FL and MTM Hands Down, owned by Beechwood Stables, LLC, captured the reserve honors. The pair earned a first round score of 173.5, and after winning the hand round with a score of 203.5, they moved up to second place with a combined score of 377. Amy Momrow of Wellington, FL finished in third aboard Melissa Wight’s Aeroplane. Momrow piloted the new mount to first and second round scores of 181.5 and 193 for an overall score of 174.5. Moore originally purchased the horse for Frey with hopes that he had Derby Finals potential. 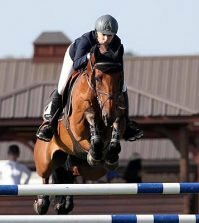 Farmer and Kodachrome have been competitive ever since she picked up the ride and piloted the talented gelding to a second place finish at the 2016 USHJA International Hunter Derby Championship. The riders praised the decision to hold both rounds of the derby on the grass field. 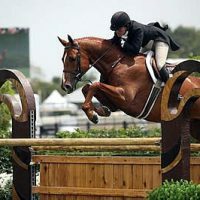 While Wylde’s mount, MTM Hands Down, is a well-known and successful junior hunter, the 14-year-old Warmblood gelding is new to the derby scene, competing in his first derby just a few weeks ago. Wylde rode MTM Hands Down to win the handy round and move up from ninth place to finish in second place. Momrow and Aeroplane are another pair new to the international derby scene, but their consistency over the two-day class garnered them a third place finish. Aeroplane was purchased as a junior hunter, but Momrow recently took over the reins to compete in the derbies with the 2006 Hanoverian gelding by Embassy. Entering the second round, Momrow sat in third place. She was the only rider who finished in the top three on the first day that maintained a top three final placing. Both Maggie Jayne of Elgin, IL and Victoria Colvin of Loxahatchee, FL, who were sitting in first and second going into the handy round, finished outside the top six. Kelley Farmer and Derby Lane, LLC’s Point Being finished in fourth with scores of 173 and 196.5 for a 369.5-point total. David Oliynyk and Lori Gaudet’s Generous placed fifth, with an overall total score of 364.75, carrying over a 174 from round one and a 190.75 in round two. Havens Schatt and Mostly Sunny, owned by CH Farm, LLC, rounded out the top six with scores of 165 and 196 for a 361-point total. Sunday’s competition concluded the 2017 Winter Equestrian Festival. Equestrian Sport Productions would like to thank everyone for another spectacular season. For full results and more information, please visit www.PBIEC.com.